A traveling junket of talent came to Denver in December to promote Glory Road. The film tells the story of the first all-African-American basketball champions in the NCAA. 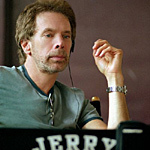 Though many people deserve credit for the film, the buck stops at the top with producer Jerry Bruckheimer. As thrilling as it sounds to sit next to the most lucrative producer in Hollywood history (two of the day’s questions were “what’s it like to be richer that God Himself?” and “Jerry, it’s snowing. Couldn’t you make a call?”), the man himself is very easygoing, enthusiastic, and knowledgeable. Nevertheless, he was always on-topic, and when a question drifted away from Glory Road, he was careful to bring it back around to the day’s business. Few producers are household names. But Bruckheimer is a major exception. I said I thought it would be as informative to say “A Jerry Bruckheimer movie” as to use the name of whoever directs. One of the younger reporters in the room (part of a kids in newspapers program) asked Bruckheimer what was toughest about re-creating 1966. I had done some research beforehand — Bruckheimer is not shy about giving interviews — and read how much he liked his job as a producer. I wondered if there was any part of his job that he didn’t like. “Yet audiences are so moved by this movie, because of the humor, because of the emotion of it, and because you learn something, and when you walk out of it, you feel good. Those are nice things to pass on. Hopefully I’ll leave things behind after I’m gone that will entertain generations for hundreds of years, and teach them something. “If you talk to anybody under fifty, chances are they don’t know anything about this team. And you talk to African-American kids and they think they’ve basketball is their sport. Prior to 1966, they were on the playgrounds, they weren’t going to major colleges. A few in the north, but not many. And even look at the NBA, they had one or two African-Americans on their teams, and that was about it. Michael Jordan would have never gone to North Carolina back in 1966. An amazing athlete would have never played basketball other than sandlot games. Magic Johnson walked in to Pat Riley — coaching the Lakers — walked into his office and said had David Lattin not dunked that ball, I might not be standing here. So at least he was educated enough to realize the significance of this team and this game. In Glory Road, coach Haskins decides to play only black players in the championship game. He does it to make a statement. But over the credits is an interview with the real Don Haskins, who said he was just playing his best players. I wanted to get Bruckheimer’s explanation for the movie’s self-contradiction. Before I could ask, Bruckheimer answered it in part, continuing, “And by the way, [Haskins] wasn’t trying to make a statement. He just wanted to win the basketball game. When he recruited those players he just wanted seven good players. He wasn’t just going out, saying ‘I’m going to change society; I’m going to change integration.’ That’s how the best things happen. They come out of necessity and need. “But there’s things that weigh on it that he’s not going to admit to. He’ll say he was just playing his best players. But when he was growing up there was a guy named Herman Carr who was a buddy of his, who was an African-American kid. He was a better player than Don Haskins; he was a great basketball player. When Don got his letters for scholarships and — he got a letter from a great coach at Oklahoma State — Herman didn’t get any. That’s sad. He didn’t get the opportunity to play. I’m sure that’s in [Haskins’] soul. After speaking at length and answering all the questions of a roomful of B-list reporters, Bruckheimer seemed satisfied, yet eager to move on. One final question caught his ear before jetting off to the next city on the Glory Road Junket. His answer came, appropriately, without hesitation. If they deported you to a desert island and you had time to grab only one CD...?